At Impact Trophies & Medals, we offer a huge range of star trophies, medals and awards suited to any event or competition. Our extensive range includes metal star trophies, star plaques and crystal star awards for any event. Impact Trophies & Medals are a leading retailer of star trophies & awards. Great for personalisation, many of our star trophies and cheap star awards can be personalised with high quality text engraving and printed logo inserts, to perfectly meet all your presentation needs. 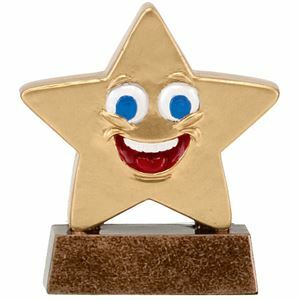 The Happy Star Trophy is a small gold resin star trophy with a glowing smiley face. Detailed with red mouth and bright blue eyes, this smiley resin star award is sure to make the recipient smile, whatever the event. Part of the Mini Star trophy collection, the Mini Star Podium Trophy features a gold coloured star set on top of a podium. Made from resin, this brilliant little trophy features tri-tone gold and texture surfaces, coated for a high gloss finish. The centre of the star can remain as a star shape, or can be replaced by your own logo or image. 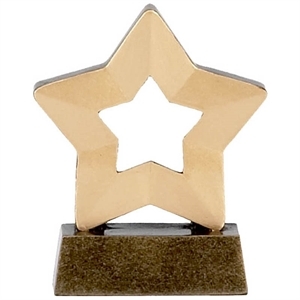 Part of the Mini Star Trophy range, this resin trophy is set on an antique gold base with a vibrant golden star top. 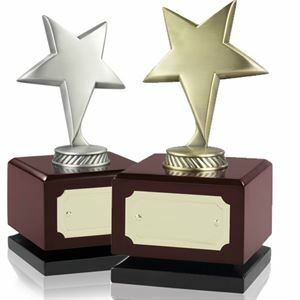 The Mini Star Trophy is versatile and can be used as a star award for any subject or sport. An excellent gift or award for a great price. The Star Photo Fridge Magnet is made up of an "L" shaped edge with embossed sun rays and a FREE engraved personalised plate. The opposite edge of the photo is held up by an embossed star. Cast from premium resin coated in a two toned gold finish. The photo frame can hold the photo in landscape or portrait. Attachable to magnetic surfaces only. Excellent price. Motivate all the players in the team by recognising their performance with an affordable trophy. 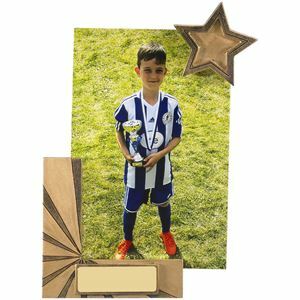 The Star Full Colour Mini Football Trophy features a star on a small base which is cast from resin and displays a full colour image. The vivid colour image is printed on a premium grade self adhesive vinyl insert and depicts a football and football boots on a green pitch. The small base takes a FREE engraving. 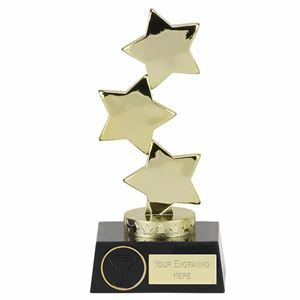 Made from premium quality gold resin, the Glitter Star Trophy is a versatile and sparkly glitter coated trophy that can be tailored to suit any event. The circular space in the centre of the star can be filled with a logo or image insert, making this fantastic resin award the perfect prize whatever the situation. The Tri-Star Trophy is a ribbon styled trophy made from high shine gold coloured plastic The ribbon holds a victory flame centre at the top, with one side of the ribbon holding 3 stars, whilst the other side displays a laurel style detailing. The Tri-Star Trophy stands on a two tiered black base with space personalisation. Set on top of a black trophy base, the Hope Star Award is a gold plastic trophy featuring 33 metallic gold stars stacked on top of each other. The trophy base allows space for personalisation, so that you can tail this award to any event or presentation. 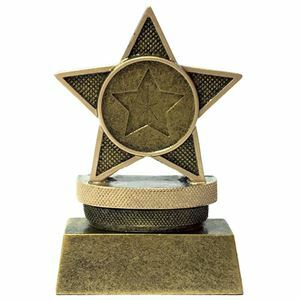 The Rising Star Trophy is a metallic gold coated plastic trophy, set upon a black base with gold trim detail. The shooting star style trophy features a cluster of stars near the base, with on large shooting star at the top of the trophy topper. The larger sized trophy has an additional black and gold riser to create a double tired base. Offered at an excellent price. 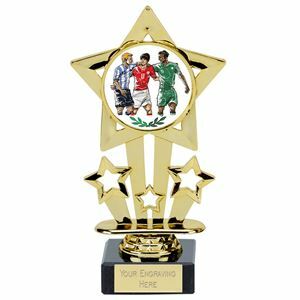 The Shooting Stars Footballer Trophy features shooting stars in a polished gold finish, with the largest star holding a full colour quality vinyl (self adhesive) image of three footballers. This award is moulded from premium grade plastic and is mounted on a solid black marble base. The trophy offers personalisation with a FREE engraving plate. Affordable price. When all the players in the team deserve recognition this trophy is ideal. The Star Golden Mini Rugby Trophy is cast into a mini star shape from quality resin and displays an image of a male rugby player running with his ball. The image is printed on a premium grade self adhesive metallic vinyl. The small base takes a FREE engraving. Excellent value. Cast from premium quality resin, the Star Golden Mini Female Rugby Trophy is shaped into a little star mounted on a small base and displaying an image of a female rugby player running with her ball and surrounded by a laurel wreath. The image is made from premium grade metallic vinyl as is self adhesive.